Check out what we've done so far! This is the Meyers Barn in Townsend, Tennessee. It was built in the 1930s and was unfortunately damaged in 2010's Spring wind storms and needed to come down. The Myers Barn - beautifully made. Plenty of great material came out of this barn! This is one of many projects we worked on in 2013. It was a historic dairy barn, circa 1880's, right in the heart of Knoxville in the city limits of Fountain City. We had lots of good pine and oak wood that came out of this one, so give us a shout if you’re interested! The Lewis Barn in all it's former glory. The roof was still intact. This picture was taken after winching 6 interior 6"x 6" oak beams between 20-30 ft tall; the darn thing did NOT want to come down! 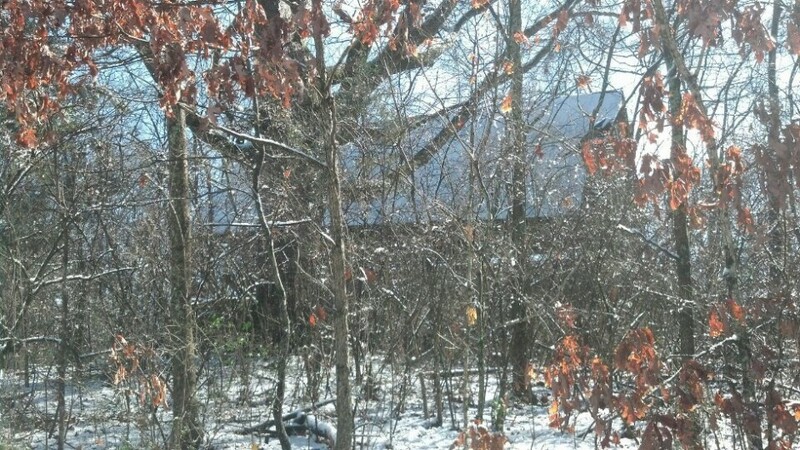 Cool shot of the Lewis Barn on a typical snowy East Tennessee morning. See all of those beautiful barn beams? They were all part of the Turner Barn in Knoxville, TN, which we salvaged in order to preserve the wood. Along with other great pieces that came out of the Turner Barn, they have been stored away for safe keeping until they find a new home. Contact us if you’re interested. Beautifully pieces used to make the Turner Barn. Before dismantling, the Turner Barn was still holding strong. The Turner Barn nestled back in the woods. 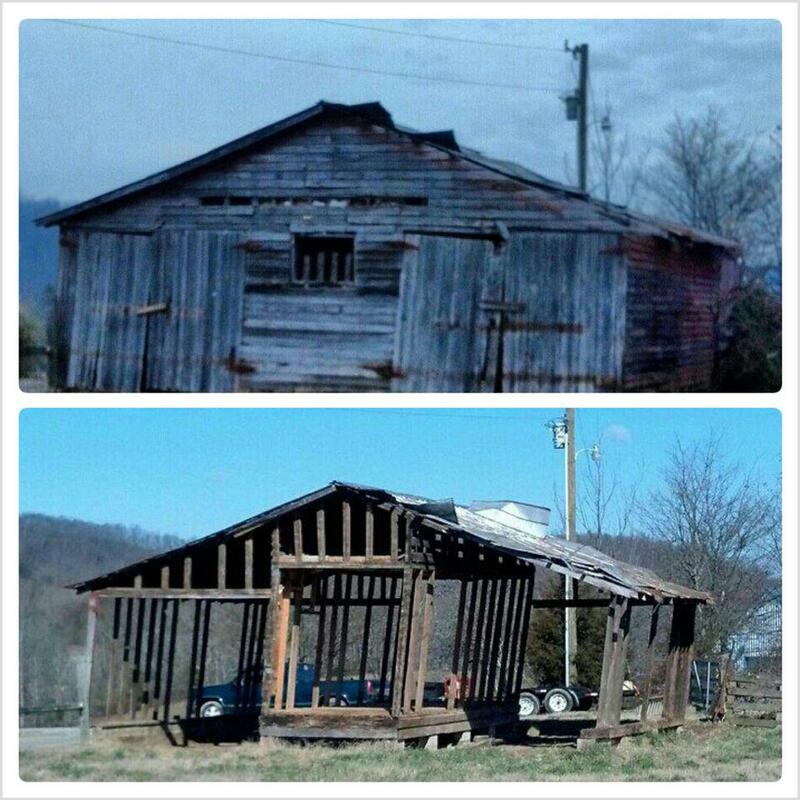 Here's a 'before and after' showing dismantling progress of our Madisonville, TN barn back in February, 2013. Within just two days we were able to drop her like it's hot. Plenty of great barn wood was salvaged from this beauty! Back in June, 2012, we dismantled this gorgeous barn located in Maryville, TN. Dimensions were: (length) 30' x (width) 28' w x (height) 30'. Unfortunately, we came across a huge yellow jacket nest in the dirt under some old wood. Needless to say, they were pissed! Never was too fond of a ten year old yellow jacket nest. We just waited until it was in the low 30's before finishing up and we all got along just fine. Never saw a one... Yee-Haw! The Yellowjack Barn's hull. Still a sight to see!